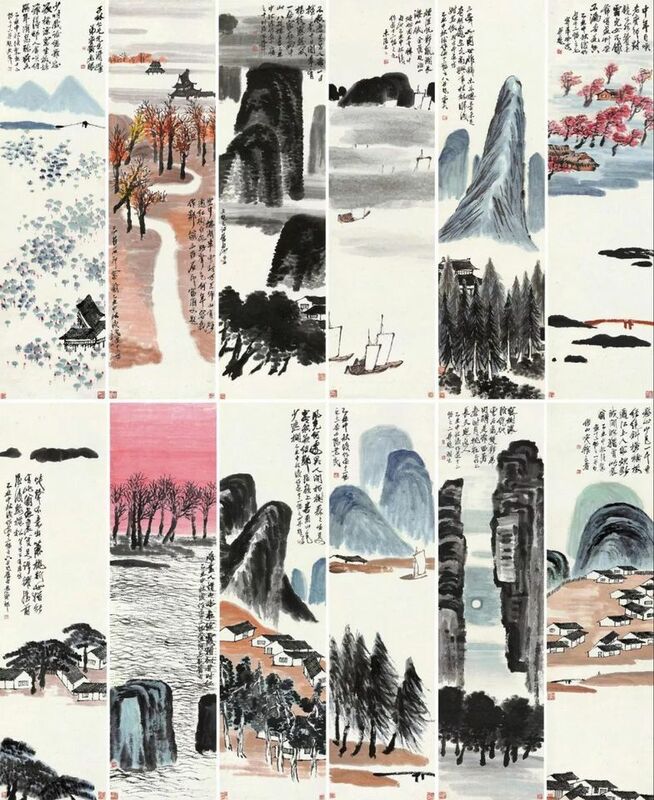 A 12-panel set of ink-brush paintings by the Chinese ­­­traditional master Qi Baishi sold on Sunday, 17 December, at Poly Auction Beijing for a record RMB931.5m ($141m). The sale, to an undisclosed Chinese buyer, is the highest auction price for a Chinese artist. Twelve Landscape Screens, painted in 1925 and measuring 1.8m by 47 cm, depicts mountain, village and fishing scenes. One of Qi's largest works, it toured to Poly's exhibition space in Vancouver in October as part of the show National Treasure. Qi, born in 1864 to a Hunan Province peasant family, is (along with Zhang Daqian) one of the last great Chinese traditionalist painters. He became a carpenter at age 14 and was largely self-taught as an artist, calligrapher, poet and seal-carver. Mentored by Wu Changshuo of the early Modernist Haipai or Shanghai style, Qi settled in Beijing and there developed a distinctively whimsical style of painting, mostly of nature and particularly animals and fruit. Poly's 12th Anniversary Sale on 17 December at the Four Seasons Hotel Beijing netted RMB2.707bn: RMB540m in ancient painting and calligraphy, RMB894m in Modern and contemporary painting and calligraphy, and RMB1.273bn in a combined section called Surpassing the Ancient and Amazing the Contemporaries: Important and Classical Chinese Paintings and Calligraphies. Other top lots in the sale include Cui Ruzhuo's ink landscape Twelve Mirror Heart for RMB241.5m, Wu Changshuo's Twelve Greenery Screens for RMB209.3m, Zhao Mengtiao's Heart Sutra for RMB190.9m—reportedly purchased by the Gansu Tianqing Museum according to The Art Newspaper China—and Li Keran's Shaoshan Chairman Mao's Residence for RMB178.2m. "On the whole, the market is getting better, but it's still hard," says Li Xuesong, the deputy general manager at Beijing Poly International Auction.